In a relatively temperate climate like Phoenix, brake repair may not seem like an important process. 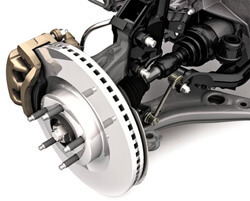 However, your brakes are by and large one of the most important systems in your vehicle. The reason that we can say this is confidence is because car brakes are the foremost safety system in your vehicle. At Tucker Tire and Auto, we take great care to ensure that your brake service will allow you and your passengers to remain safe on the road. Despite popular belief, there is no such thing as the $20.00 all inclusive brake repairs. Phoenix residents, when faced with these offers will often jump at the opportunity not understanding that the products used, and the quality of the brake repairs will suffer because of the low price point. The fact is, brake service is something that cannot be left in the hands of pseudo professional technicians. The reason for this is because every driver needs their brakes to work, every time they use them. Another important thing to understand about brake repair is that it does not need to be excessively expensive to be effective. If the job is done correctly the first time, you should not need to constantly replace brake fluid, rebuild your master cylinder or resurface your rotors. You should only need to inspect the system for leaks or other problems. At Tucker Tire and Auto, our approach to brake service is one that will actually save you money over the long haul because you won’t need to worry about the health of your brakes. By making sure that the job is done correctly the first time, you will be able to drive with absolute confidence in your vehicle, and the proper function of your brake system. There are a few things that need to be addressed directly when it comes to a brake repair job. Here is the short list of components that must be attended to if you are to be certain that your brakes are safe. Brake pads or Brake Shoes – Depending on the quality of the parts installed, brake pads and brake shoes can last varying amounts of time. The good news is that your brakes will let you know when the time has come to replace them. That familiar whining noise you hear when stopping is an excellent indicator that your brake pads are ready to be replaced. Master Cylinder – The master cylinder in your brake system is what augments the force of your foot on the brake pedal into the force required to stop your vehicle. The master cylinder is what drives this process through a series of hoses and pumps. This is by far the most expensive system in your brakes, and should be checked periodically for any issues. Rotor – The whole secret to never needing a rotor resurfacing or replacement is to make sure to that your brake pads never wear down past the point of usefulness. This will help ensure that the rotors will not suffer any direct damage from friction or heat, and preserve the rotors for years to come. At Tucker Tire and Auto, we want to help you make sure that your vehicle is constantly performing at its best. By taking the time to repair your vehicle properly, you can expect that your vehicle will continue to serve you faithfully for many years into the future. Contact us today if you have any questions regarding what we can do for your vehicle. Our staff is standing by to make sure that you get the information and answers you need.